Ahead of elections later this year, Belarus once dubbed 'Europe's Last Dictatorship' is launching a fierce new crackdown on journalists and human rights defenders. Throughout the winter, while Russia watchers trained their attention on that country's incursions in neighboring Ukraine, President Alexander Lukashenko's regime in adjacent Belarus stealthily moved to reduce people's exercise of civil rights. In an apparent effort to avert a resurgence of anti-fraud protests for the upcoming Belarusian elections in November 2015, the Lukashenko administration launched a series of actions to deter advocates of transparency, free speech, and public participation. The suppression evokes memories of the previous presidential polling in December 2010, when the world recoiled at the regime's bloody post-election crackdown on demonstrators in the capital city of Minsk. On November 20, 2014, exactly one year before the next elections, Lukashenko signed new media law amendments giving the state-owned Internet Service Provider (ISP) monopoly Beltelecom carte blanche to legally block websites. The amendments allow the information ministry to prevent access to news websites without court authorization and forbid unregistered foreign TV programs from broadcasting. The measure was supposed to take effect January 1. However, the government ISP didn't wait for that date to deny access to many of the most popular independent websites, such as charter97.org and belaruspartizan.org. On December 18, the eve of the fourth anniversary of the previous elections, the ISP jammed the domains of the country's only independent news-agency, belapan.by; closed the most popular web portal, tut.by; and even blacked out the shopping site onliner.by. The Belarusian Private News Agency (BelaPAN) -- which experienced the shutdown of its websites belapan.by, belapan.com, and naviny.by -- subsequently put out a statement: "It is clear that the decision…could only be made by authorities, as in Belarus the government has a monopoly on providing Internet addresses. BelaPAN had not received any official warning or notification about the coming blockage." Leading up to the censorship, Belarus experienced a wave of unprecedented persecution of journalists and human rights defenders. It began with the November 5 expulsion order of well-known lawyer Elena Tonkacheva, head of the human rights non-profit Lawtrend. Going beyond what it had dared in the past, the state used Tonkacheva's Russian citizenship to kick her out of Belarus for a speeding ticket -- despite her 30 years of residency in Belarus, a Belarusian daughter, and joint recognition between the Belarusian and Russian governments of citizens' reciprocal rights. Belarusian civil society deemed the real reason for this deportation order to be Tonkacheva's civic and professional activity during previous elections. The UN High Commissioner for Human Rights has undertaken a review of the Tonkacheva expulsion. Then, on November 25, the Belarusian State Security Committee arrested journalist Alexander Alessin, the economic commentator for the weekly newspaper Belarusians and Market, on suspicion of spying. An expert working exclusively with open-source software, Alessin eventually was released on bail for health reasons, and the charges were reclassified as "communicating with foreign intelligence." The web blackout the following month occurred just in time to obscure Belarusian officials' arrest of filmmaker Olga Nikolaichik, who flew the red and white flag symbolizing opposition to Lukashenko's regime near the church on the main square of Minsk during a December 19 prayer for the heroes of Belarus and Ukraine. Since then, Belarusian authorities have continued arresting activists, not only for prayer in commemoration of the victims of the conflict in Ukraine, but also for laying flowers at the monument to Ukrainian writer Taras Shevchenko. The rash of censorship, expulsion, and arrests echoed the repression surrounding the 2010 elections, when 50,000 people streamed through the main avenue of the capital in a rally against repeated vote fraud. Enthusiastic supporters of the cause could look down the street and see no end to the river of non-violent participants. However, their hopes for change soon turned to horror as riot police squelched the demonstration. The world watched images of the special forces breaking up the peaceable assembly and beating the victims until some of them lost consciousness. The Belarusian regime knew and feared that the demonstrators were not only protesting against election fraud but also aiming to upset the balance of power. Cameras captured gory scenes of presidential candidates battered and knocked down to the cold December pavement for daring to deride despotism. The Belarusian State Security Committee kidnapped injured ex-presidential candidate Vladimir Nekliaev from the hospital, dragging him across the floor on a blanket in front of his relatives and human rights defenders. Other people beaten were jailed instead of hospitalized. Unsuspecting bystanders were arrested at bus stops for allegedly participating in unsanctioned street protests. Many people ended up in prison, many others in exile. In January 2011, journalists found out about a special training camp established to drill riot police in how to suppress the anticipated rally-goers. The Committee to Protect Journalists (CPJ) expressed "alarm" over the new surge of oppression, saying, "Belarus is already one of the world's most repressive societies, and the new amendments to the country's Media Law add further restrictions on freedom of the press and freedom of expression." CPJ's Europe and Central Asia Program Coordinator Nina Ognianova called on the government "to scrap these restrictions." She added, "Since traditional news outlets have been subdued, the government has turned to censoring the Internet -- the last remaining space for independent news and views in Belarus." The U.S. government issued a statement about human rights in Belarus on the anniversary of the 2010 police action. "We remember those who remain wrongly imprisoned and call for the immediate and unconditional release of all Belarusian political prisoners and the complete respect for their political and civil rights," it read. The declaration also encouraged Belarus to"honor the U.S.-Belarus December 2010 joint statement." That statement, signed by then U.S. Secretary of State Hillary Clinton and Belarusian Foreign Minister Sergei Martynov on December 1, 2010, acknowledged "that enhanced respect for democracy and human rights in Belarus remains central to improving bilateral relations, and is essential to the progress of the country and its citizens." However, the document provided no specifics regarding democratic reform, as the post-electoral repression was soon to prove. If the United States is serious about promoting liberalization in Belarus, its diplomacy should go beyond paying lip service to a vague statement of principles. Belarus is a signatory to no fewer than seven international human rights conventions containing legal instruments and providing for monitoring bodies. These include the UN Universal Declaration of Human Rights; the International Covenant on Civil and Political Rights; the International Covenant on Economic, Social, and Cultural Rights; the International Convention on the Elimination of Racial Discrimination; the Convention on the Elimination of All Forms of Discrimination against Women;, the Convention Against Torture and Other Cruel, Inhuman, or Degrading Treatment or Punishment; and the Convention on the Rights of the Child. The legal instruments in these conventions can be invoked if the State Department chooses to support the reforms that Belarusian media and citizens demand. The problem of U.S.-Belarusian relations today is that Washington's approach to the assessment of the human rights issues in Belarus is not thorough enough. The United States is not involved in the UN Economic Commission for Europe process, which systematically appraises Belarusian state activities in the context of these treaties and conventions.Short of taking part in that process, however, the United States still could support a democratic future for Belarus by making its own professional, qualitative assessment of the Belarusian situation. But given the fraught political environment in Eastern Europe, whether Washington will find the political will to do so remains an open question. Tatyana Ivanova, of Belarus, and Talli Nauman, of the United States of America, are journalists and volunteer members of the negotiating team for the NGOsector in the UNECE Aarhus Convention on Access to Information, Public Participation in Decision-making, and Access to Justice in Environmental Matters. 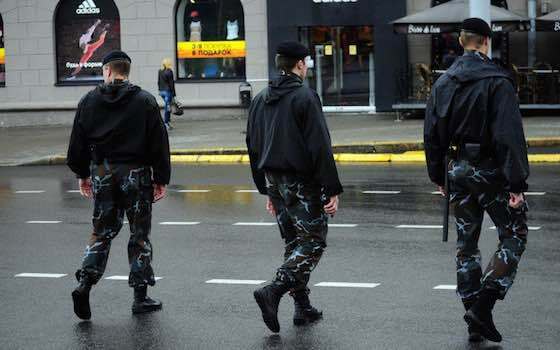 "A New Crackdown in Belarus"